The life of a bird in the winter may not be as stress-free as many people think. In much of North America, winter can be a difficult time for birds. The days are short, and nights are often cold and long. The natural food supply has been consumed or is hidden by snow. Most insects are dead or dormant. Water can be hard to find, and food needed to provide the energy to keep birds warm might be scarce. Finding shelter many not be easy. Birds are warm-blooded. In general, this means that they maintain their body temperature within a certain range even when the temperature around them changes. That body temperature depends on the amount of heat the bird produces. As winter approaches, you may need to change some of the foods you offer to birds. Providing high calorie and high fat foods can be important to the birds. 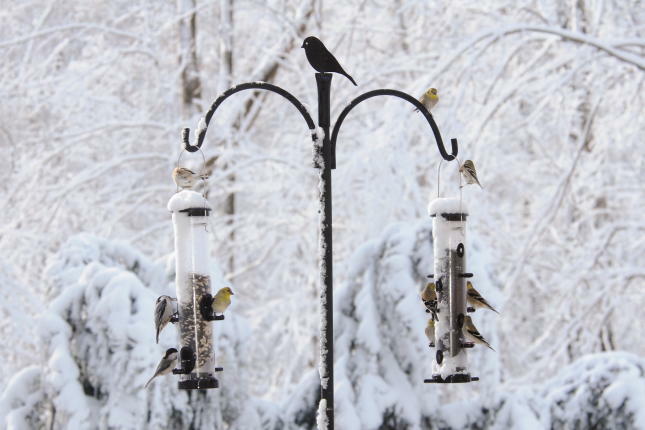 The birds visiting winter feeders may be arriving in flocks or may come to the feeders as individuals, so you will need to provide options for the birds. Feeders should be located out of the wind. The east or southeast side of the house or near a row of trees is ideal. It is best to have a perching spot such as a bush or tree for the birds to use to survey the feeding area and provide sufficient cover for safe refuge from predators and shelter from the wind and weather. The feeders should be positioned near cover but in the open to allow birds to watch for danger. There are some times when birds are not prepared to deal with sudden drops in temperature or sudden winter storms. At times like these, it is especially helpful to have feeders full so that birds can find food readily. Happy Bird Feeding! (Kathy and her husband, John, own and operate the Wild Birds Unlimited, located at 111 S. 24th Street. Billings and at www.wbu.com/billings).